VT-Initiative for Maximizing Student Development (IMSD) is a training program designed to increase the number of minorities with a PhD in biomedical and behavioral sciences and engineering who want to pursue a career in biomedical research in accordance with the NIH mission. Our training program is a partnership with departments and programs in all colleges at Virginia Tech. The program emphasizes community, mentoring, and networking as a foundation to becoming a successful undergraduate and graduate student. VT-IMSD is supported by the National Institute of Health through the National Institute of General Medical Sciences with institutional support from Virginia Tech. IMSD provides financial support in partnership with departments and other units for students enrolled in a Ph.D. program at Virginia Tech. Students participate in hands-on, bench research projects under the supervision of a PI. Students are expected to participate in research lab activities up to 20 hr/week during the academic year and 40 hr/week during summer. 85 percent of IMSD alumni (from the predoc program) have received a Ph.D. and are pursuing a postdoc or a position at a Research 1 University or in industry. 70 percent of the undergraduates who participate in the IMSD prebac program are in Ph.D. programs at different institutions including Brown, Duke, NC State, and Stanford. 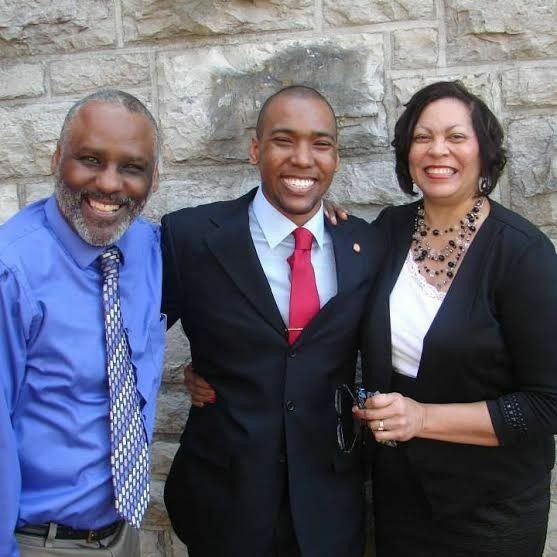 IMSD Alum, Jordan Booker Ph.D. and his parents. He is currently a professor of Psychology at the University of Missouri.